The weather has turned colder so it’s time to cocoon inside the house around the fire. That’s not necessarily true for many Ohio homeowners who are increasingly using the their backyard entertainment areas during three out of four seasons. As long as there isn’t a foot of snow on the ground, there’s no reason that you can’t have a cookout and enjoy your gorgeous outdoor space in the colder months. 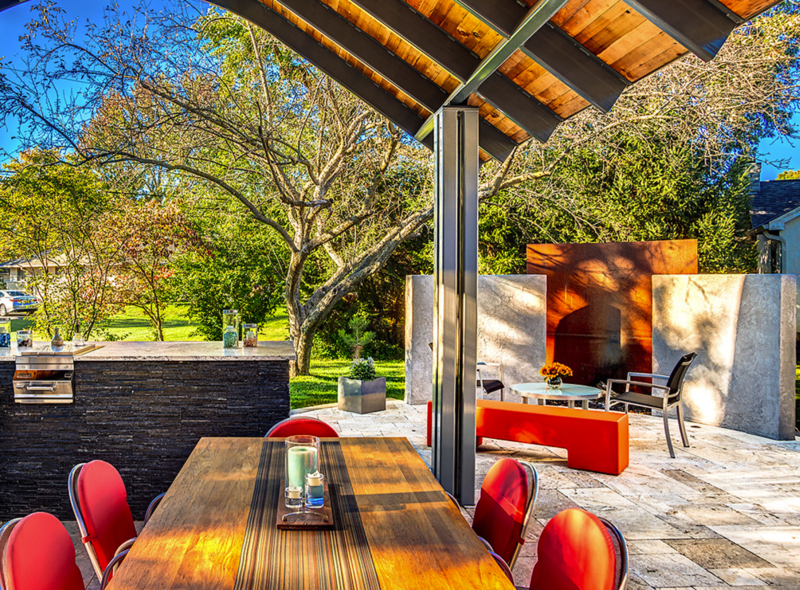 All it takes are some creative patio design tips to keep you and you guests warm and toasty. Create a Windbreak. One of the most useful backyard tips for creating a usable patio design in colder months is to make sure that you have a windbreak to prevent cold winds from chasing everyone indoors. Work with your landscaping architect to determine from which direction prevalent winds blow during colder months and set up a berm or a decorative wall in that area to block breezes. Another option is to place your patio in a naturally sheltered area of your yard. Add an Outdoor Fireplace or Fire pit. 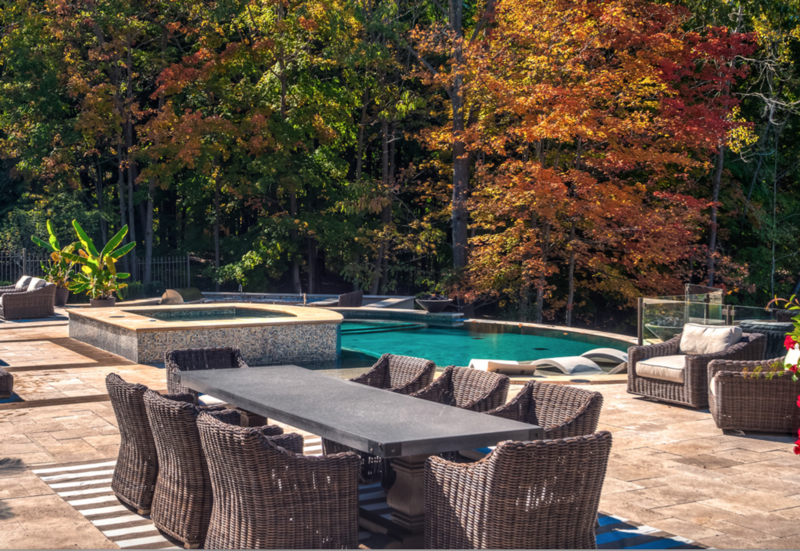 A source of heat is essential for outdoor entertaining during colder weather. From small portable firepits for informal spaces to gorgeous masonry fireplaces, the addition of heat to your outdoor entertaining area is a must. These features not only add atmosphere to your parties, but will also add value to your property. Patio Heaters. Even with an outdoor fireplace or firepit, it’s a good idea to add patio heaters, particularly if your entertainment area is large. The further away you go from the heat source, the colder it will get. Patio heaters are available in electric or propane types and come in stand-alone, tabletop or wall-mounted models. 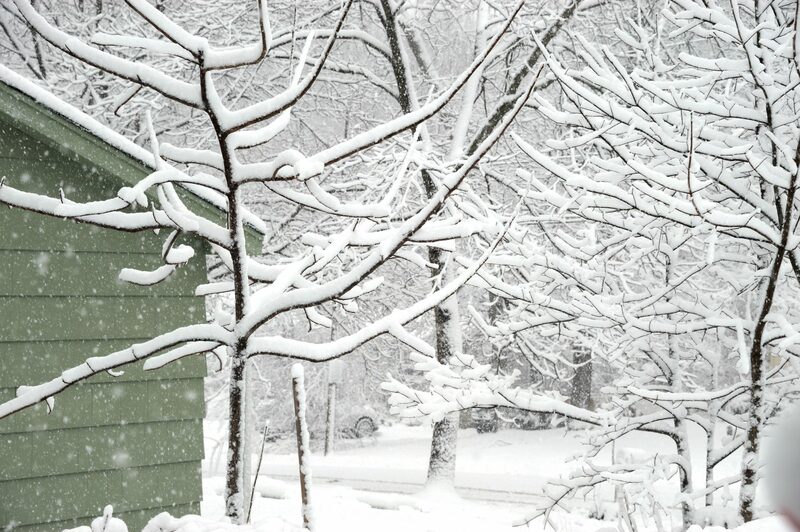 If possible, make sure you place heaters under overhangs or awning to trap as much heat as possible as warm air rises. Outdoor Kitchen. This is a feature that you will use all year, but make sure you have plenty of storage space as well as a food preparation area. After all, who wants to go walking back and forth to the house in cold weather. Outdoor Seating. Use furniture that retains warmth, but not moisture. Pick furniture with insulated padding and a water-proof protective surface that will retain body heat during cooler weather. Go for an enclosure. Screens can be used to control the temperature on the patio. By providing shade from excess breeze, screens are great for generating warmth. Best of all, there is a screen available for pretty much any budget. The choices range from plastic to glass walls, which allow clear views of your surroundings. They also help the patio to stay dry. Bring the heat. Having an outdoor fireplace is a great method for extending patio time during the winter. Cranking up the fireplace is a remarkable way to keep loved ones warm while entertaining during the winter. There is the option of having a permanent fireplace or using portable fireplaces. A propane-powered outdoor heater can also be used to bring heat to your patio during the winter. It will keep you warm as you strengthen bonds with the people you love. Winter is the perfect time for roasting marshmallow and laughing with your loved ones. An outdoor heater can help to make it happen. Add warmth and comfort. Nothing is quite as soothing and comforting as having pillows and blankets to keep you and your loved ones warm while spending quality time on your patio during the winter. There are few things cozier that draping yourself with a warm blanket, while snuggling up to a fluffy throw pillow or two. With the pillows and blankets, the overall décor will get a boost as well. Adding seasonal colors is great for a visual feast. 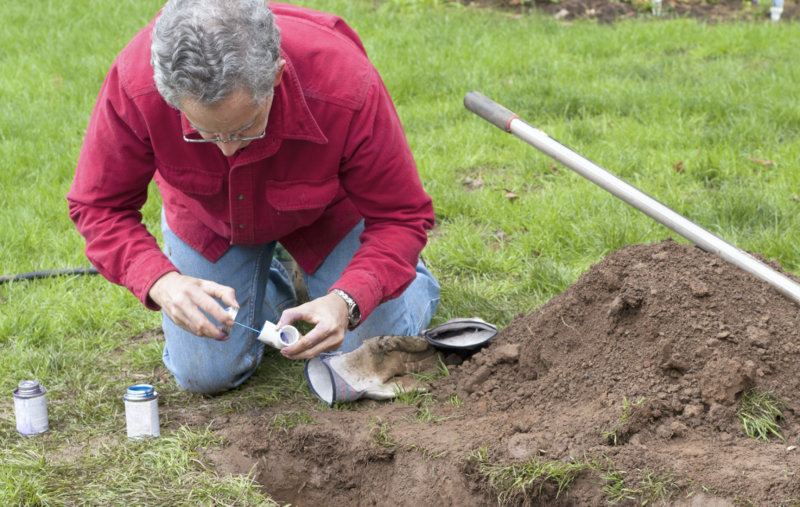 Winter is the perfect time for landscape redesign. Plants are in a dormant state, watering concerns are low or absent, and cooler temperatures are an optimum for building and re-shaping home or commercial landscaping features. The absence of summer time foliage also makes seeing the possibilities for a new design easier. 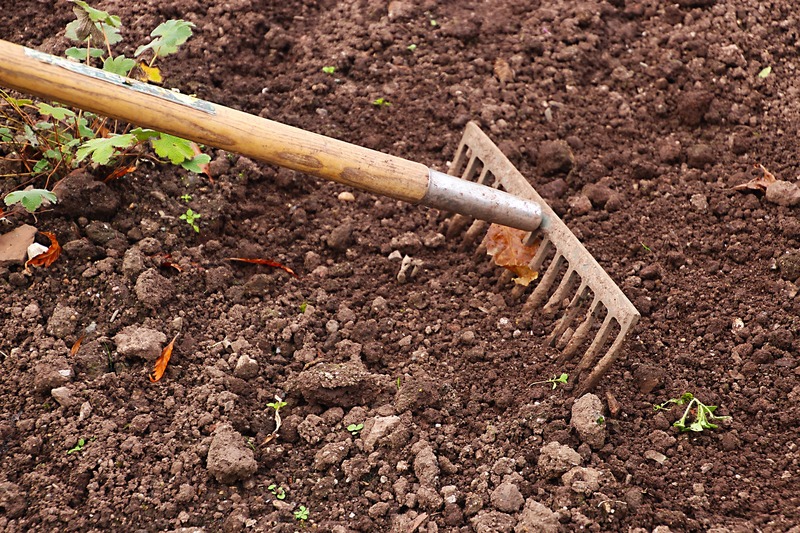 Winter is also the best time for planting most perennials like trees, shrubs, and bulbs. 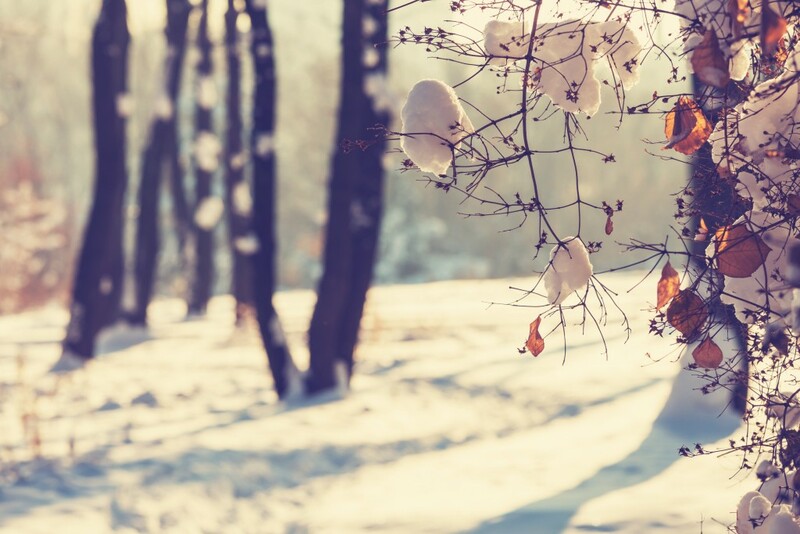 Here are some tips for homeowners who are considering making changes in their landscape this winter. Start Early: Planning a landscape takes time. Envisioning, measuring, estimating, scheduling, and actually starting work are separate phases of landscape redesign. Landscaping includes both fixed ‘hardscape’ features like patios, retaining walls, planter boxes, and stone walkways, as well as the ‘softscape’ features of the soil and plants themselves. Irrigation lines and electrical hook-ups are other considerations needing careful attention in the design phase. Taking your time and not rushing in the planning stage is the only way of addressing all of these aspects of a new landscape and creating the best design to match your vision and your budget. 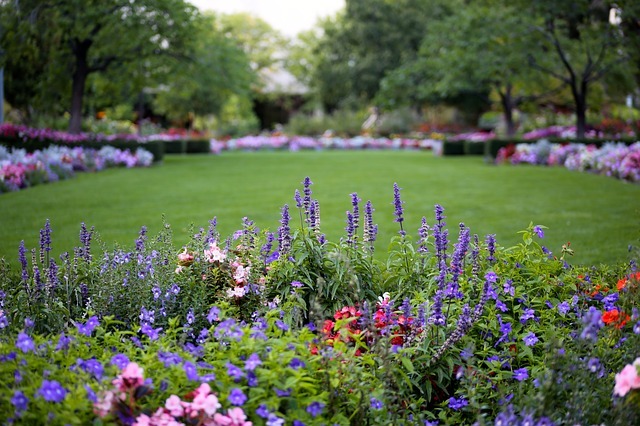 Look Around: There are almost unlimited possibilities when redesigning a landscape, and looking at other designs online or in the neighborhood is a great way of getting ideas. Even if you have a firm image in your mind already, checking out what others have done may bring you some surprising inspirations. Make a Drawing: Making a drawing can be helpful in assuring that the details of your vision are realistic. Big planter boxes or a wide patio may sound right, but measuring the area and making a scale drawing is the only way of ensuring that everything will really fit in a given space. Making your own drawing also makes it easier when communicating your vision to your landscaping contractor. There are a number of apps for making drawing for a landscape redesign, like Google Sketchup, if you do not like the pencil and paper approach. Whatever drawing medium you use, make your drawing to scale, like one-half inch equals one foot, and begin by drawing ‘hardscaping’ features, like buildings, driveways, and existing plantings that will remain. If you first make multiple copies of your drawing of hardscape features, you can then sketch out multiple designs and layers on separate pages of the copies. Using different colored pencils for each new type of feature — tree, shrub, gravel walkway, stone path — is one way of making your design ideas stand out on the page. The weather has turned colder so it’s time to cocoon inside the house around the fire. That’s not necessarily true for many Ohio homeowners who are increasingly using their backyard entertainment areas during three out of four seasons. As long as there isn’t a foot of snow on the ground, there’s no reason that you can’t have a cookout and enjoy your gorgeous outdoor space in the colder months. 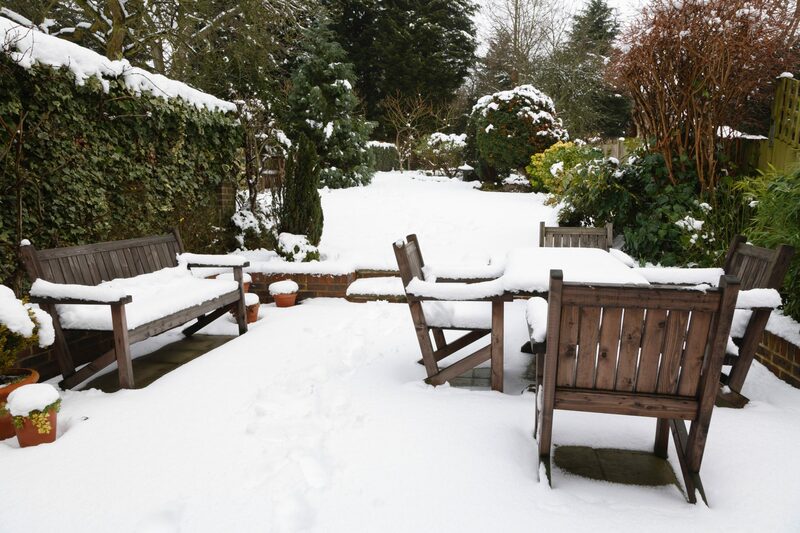 All it takes are some creative patio design tips to keep you and your guests warm and toasty. Add an Outdoor Fireplace or Firepit. 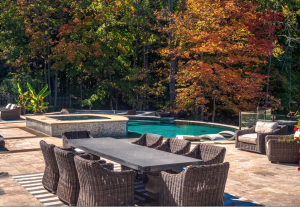 A source of heat is essential for outdoor entertaining during colder weather. 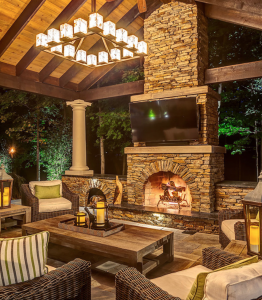 From small portable firepits for informal spaces to gorgeous masonry fireplaces, the addition of heat to your outdoor entertaining area is a must. These features not only add atmosphere to your parties, but will also add value to your property. Patio Heaters. 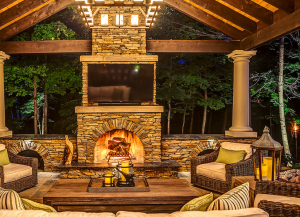 Even with an outdoor fireplace or firepit, it’s a good idea to add patio heaters, particularly if your entertainment area is large. The further away you go from the heat source, the colder it will get. Patio heaters are available in electric or propane types and come in stand-alone, tabletop or wall-mounted models. If possible, make sure you place heaters under overhangs or awnings to trap as much heat as possible as warm air rises. Outdoor Kitchen. This is a feature that you will use all year, but make sure you have plenty of storage space as well as a food preparation area. After all, who wants to go walking back and forth to the house in cold weather?